I complained about Beijing being impersonal and having lost its soul. It’s been seven days and nothing I’ve seen has changed my mind. The city is a gigantic sprawl. The buildings are so far back from the road that, when you walk down the sidewalk, it’s hard to feel like you’re making progress because it doesn’t feel like you’re passing anything. Traffic is mostly cars and is always constant. The smog here makes L.A. look like British Columbia—sometimes, when I stare down the road, I can barely make out the next traffic light. 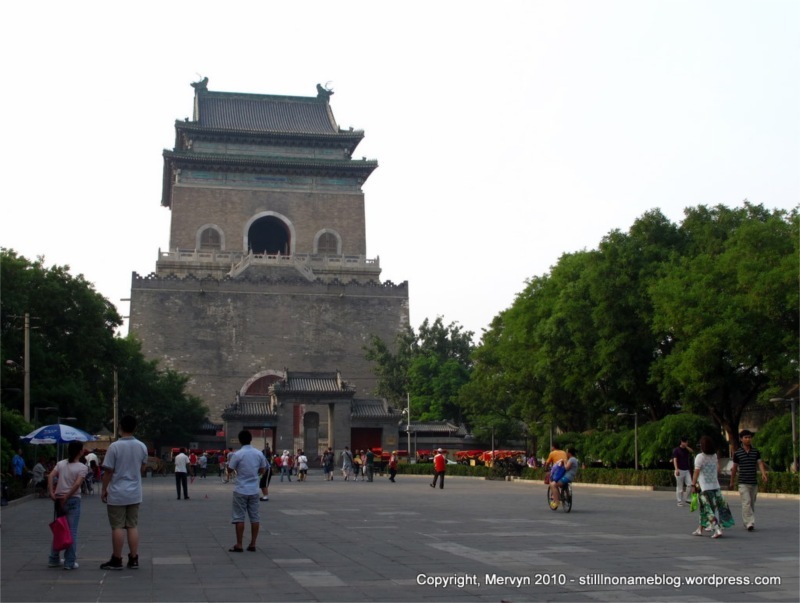 Today, I hoped I could find a bit of what’s left of old Beijing. Rumor has it that there are places where you can still find the old town. Between the big buildings and new developments, some neighborhoods have survived. 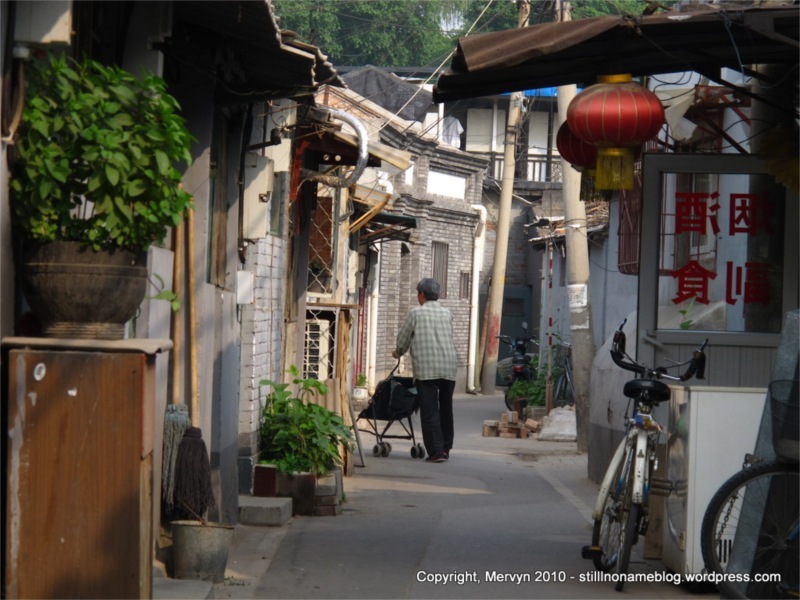 These hutongs, or alleyways, tend to run east-west to protect from dust storms that come from the north in the spring. 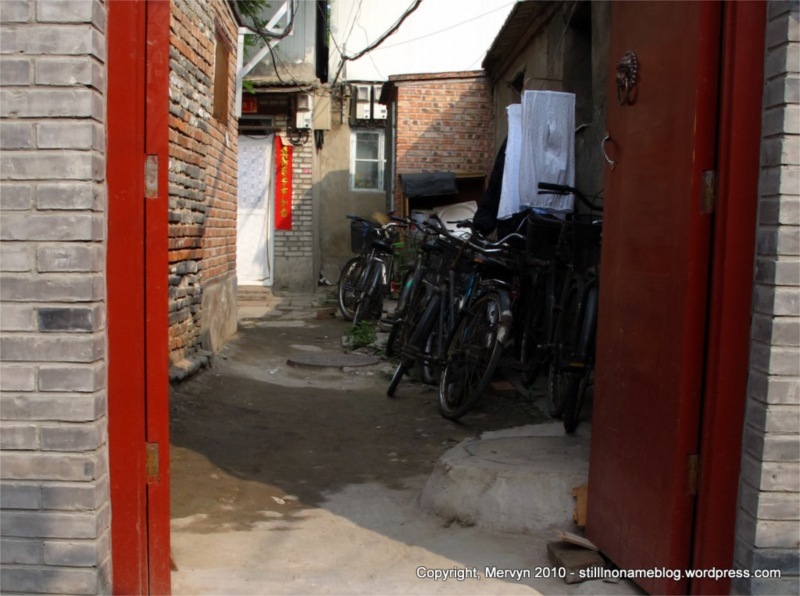 The hutongs tend to be narrow, usually just wide enough to accommodate one car. I’ve heard that some are much smaller, with barely enough room for two pedestrians to pass. The hostel I’m staying at is actually in a hutong. 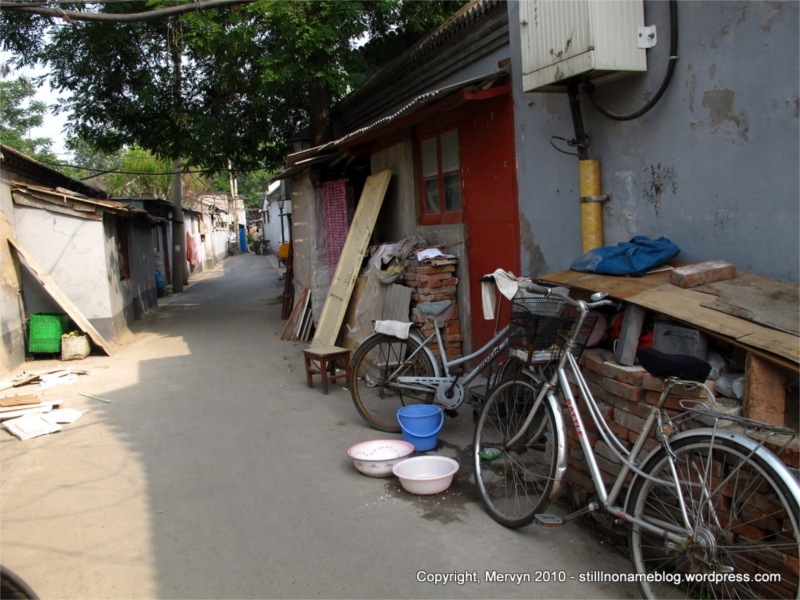 Hutongs are scattered around town, so the best way to explore them on your own is to rent a bike and duck into a hutong if it looks interesting. I decided to combine this with a bike tour suggested by my tour book which ended around Houhai Lake. 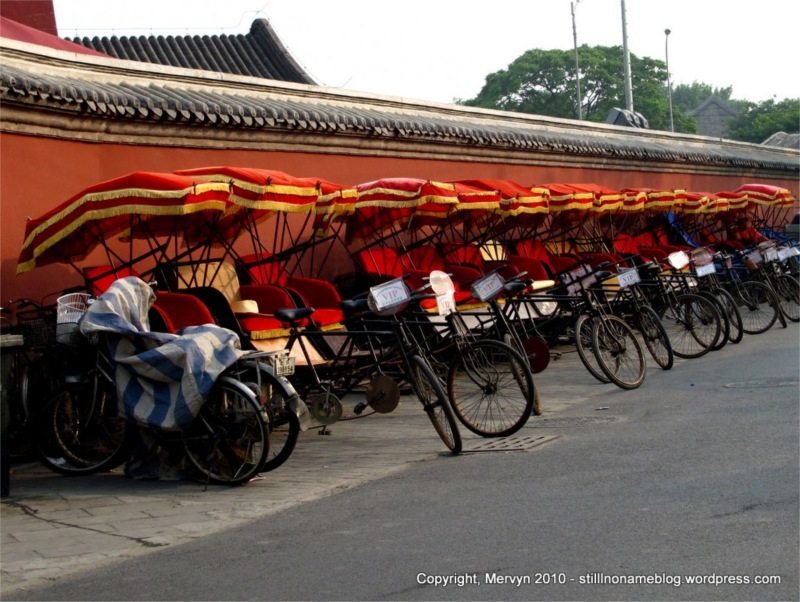 I rented a bicycle (20 rmb or $3.10) and headed off to the Forbidden City. Being on a bike changes Beijing. You’re no longer on an urban death march to nowhere. The city shrinks just enough to make it feel accessible. You can pedal, coast, and enjoy your self-made breeze. Just keep an eye out for cars which, you’ll discover quite quickly, do not stop on right hand turns even if you’re directly in front of them. The route took me past the south palace moat which I didn’t realize doubled as a park. Willows lined the road and rustled in the wind. Chinese people lounged by the water in the shade. Even though it looks like it might be restricted, you can bike right past the Meridian Gate, which is where most people start their visit to the ticketed portion of this national landmark. 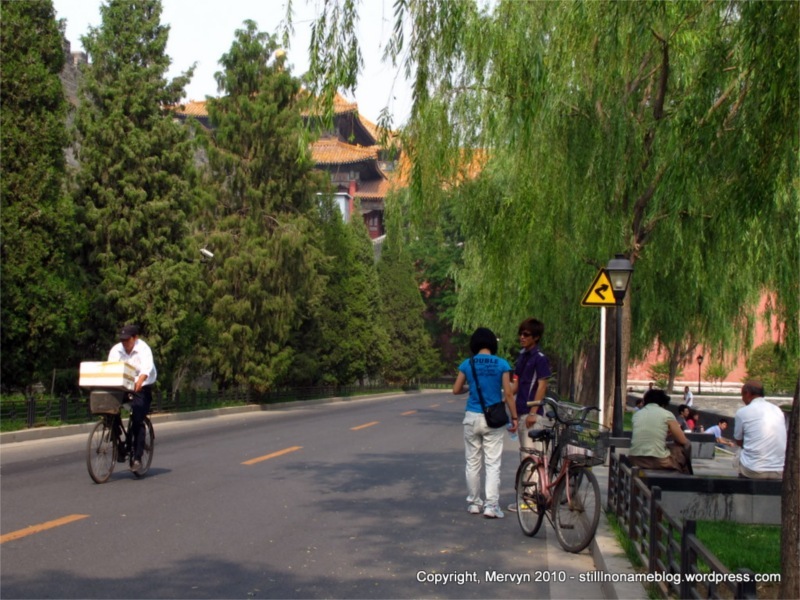 For a split second, I felt like I was in old Beijing, pedaling along cobblestone in the shadow of the palace wall. A bit farfetched, perhaps, but maybe not, since the last emperor reigned into the early 1900’s. 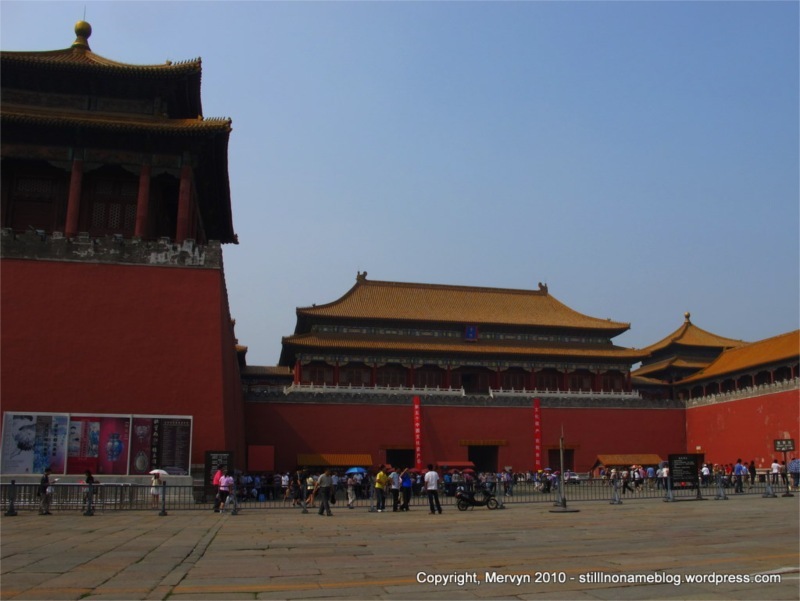 I headed up the west side of the Forbidden City wall and up past Jingshan and Behai Parks. I finally made it to Houhai Lake, which is where Max and I hung out at 31 Bar (which I mistakenly remembered as “Club 31”) and listened to Earth’s first Uyghur flamenco band. The lake is much different during the day. First off, I didn’t get propositioned for lady bars every 20 feet. Also, it’s not as pretty as at night when all the lights are on and reflecting off the lake. It felt much more like a park. A group of people were swimming back and forth between the lake’s edge and a small island in the middle. Almost all the men were in speedos. Beijing’s more like Europe when it comes to swimming with your junk properly cradled. I headed to the north end of the lake and started ducking in and out of the surrounding hutongs. This is the Beijing I imagined. As I pedaled down the narrow passageways I passed small storefronts, laundry, bicycles, piles of bricks, kids being pushed in strollers, children walking home still in school uniforms—really, just people living their lives. New Beijing doesn’t really have that. Everything is hidden behind walls or is far from the street. Above ground, most people are in cars or cabs, isolated from the rest of humanity. The bustle all happens underground, in the subways, where you’ll see groups of people forced together out of necessity. It’s way too much like Southern California, actually. My favorite scene was a group of people playing mahjong in a little open air storefront. There were about five automatic tables. Each foursome stared at their tiles intently while the tables rattled as (I presume) the tiles were mixed up underneath. Things like this really make you feel like you’re seeing into the heart of a city. You can see the people, not just glass, brick, and steel. Peek into a little courtyard and you can see bicycles leaned against a wall. Glance into a doorway and you can find families chatting while cooking dinner. Men were on the street, giving each other a hard time about something. Each little human interaction provides a glimpse into local culture. The hutongs are so intimate, in fact, that I couldn’t bring myself to take pictures while there were hordes of people around. It’s not like I could discreetly shoot from across the street. The alleys are so narrow that I’d be in someone’s face with a camera if I wanted to take a picture. I’m a tourist but not that much of a tourist. As I rode past the Drum Tower and the Bell Tower (burned down and reconstructed, more than once, I think), I thought to myself that this is what I’ll miss when I go back to the States. I will miss the energy that you feel when you live your life around other people. I will return to the land of the car and the suburb and the yard and the high fence. When I go for my jog, I won’t see people chatting with their neighbors or walking to the local restaurant to grab a bite to eat. People back home aren’t forced to live together. They can maintain their own personal spaces, moving from their homes, into their garages, into their cars, then into their offices and back home again. Here in the hutongs, then, is one of my favorite things about Asia. A sense of community. If Beijing has its way, though, this could be all gone in a generation. 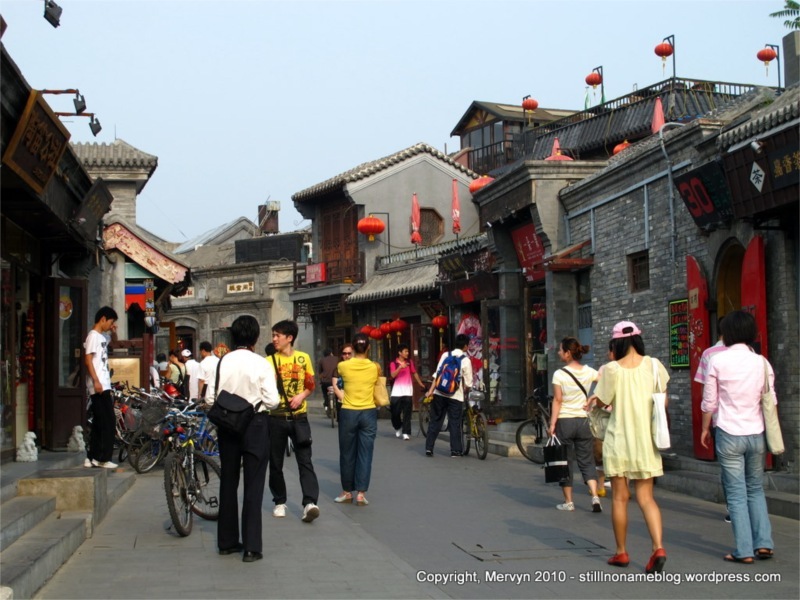 The only hutongs left will be those that are turned into shops catering to tourists. I’m not against progress, development and poor people getting their share of the pie but, in keeping with the food theme, I do wish there were a way to have my cake and eat it, too. I biked my way along a six-lane road through the busy Beijing traffic and back to the hostel. I took a nap, accidentally overslept, and met Max, his buddy, and their girlfriends a bit late for dinner. A leisurely meal of Japanese. Later, we hit a place called Fu Bar which in America means one thing and in China means “Happy Bar.” Love it. In English, it’s a bit edgy. In Chinese, it sounds like a place where you might bring your kids. The place initially was a failure because it was set up like a speakeasy—you walked through a hot dog restaurant, down a staircase, and hit a light switch to open a passageway in the wall to the bar. This kind of place is the opposite of Chinese. As Max’s girlfriend put it, if you’re the coolest, most successful place in town (or want to be), why would you want to hide it? Again, I’m not sure the idea of understatement’s quite taken hold China. The place wasn’t packed, but as we left, more people were coming in. Not surprisingly, most were ex-pats. We headed to a giant hip hop club and got our groove on. The music was actually pretty good. It seems like most of their stuff is circa 2002, which means me the old guy actually recognizes and enjoys it. If you forgive the occasional forays into Lady Gaga and the like, it was fun. Go with me on a tangent for a second: I want you to rate yourself as a dancer on a scale of 1 to 10. Got it? Okay. Now, when you come to China, take whatever number you had in mind and add 10. I’m serious. I felt like I was the love child of Michael Jackson and Gene Kelly—I had moves, baby. If you can keep a beat and have a good time, you’re ahead of the game. Clubbing is apparently a bit of a niche thing in China. Here, the vast majority of people come to lounge on couches and drink. And we’re not talking small VIP areas like in L.A. No, the difference here is that 90% of the floor space is couches and cushy chairs surrounding tables and only 10% is devoted to dance. People sit around, order plates of fruit, and buy watermelon sized bottles of Chivas that just sit on the table (I didn’t notice anyone drinking any). If you like, you can have the club store the bottle for you so that next time you can drink what you didn’t finish. Ordering drinks is different, too. Chinese don’t usually order one beer or one shot. They order six or seven, have them brought out at once then, work their way through them one by one. The whole scene seems to be geared to making sure everyone understands that you have a bunch of money to throw around on booze. People don’t seem to talk much. The dancing is ancillary. What tripped me out even more on this night was the World Cup. China is so obsessed with football (soccer) that everywhere we went TVs were tuned to the games. Bars, restaurants, big outdoor TVs in the shopping centers and stadiums. And, get this, in the club. Where you’d normally see videos playing on screens that sort of match the music, they were showing a live World Cup match. Guys were dancing, drinking, and all facing forward watching the game. All while sort of paying attention to all the attractive women around them. I admit it, since the TV was on, it was hard not to watch. In fact, a lot of the girls couldn’t help watching either. Hip hop was blasting through the speakers and white guys were running around on screen kicking a ball. Bizarre. On my end, I had a good night. Max ran into his friend, a DJ, and we hung around to hear some of his set. As Max promised, the guy was good. Not only was his music good, he actually did work. His transitions were well thought out—he wasn’t just pushing “Next” on his iPod. I guess that’s the price of progress. My having a good time tonight is kind of a result of the wild growth that’s destroyed my favorite part of Beijing: the hutongs. There are many steps in between, of course, but I wouldn’t be surprised if, at some point, the place where the club is now used to be a small neighborhood. For now, I’ll enjoy what’s here, both the old school hutong version of Beijing and the new school, capitalist, indulgent side of the city. GALLERY: Click through to today’s gallery to see pictures of more people’s hutongs, guys swimming in a lake, the giant red painted Drum Tower, and a picture of one of Mervyn’s red palms—because of the handle bars, silly.